A product review is essential if a designer is to learn from existing products or early models and make improvements to designs. This is a constant process as seen in the automobile industry. Car manufacturers learn from previous designs, especially from faults and strive to improve the reliability and the style of their vehicles. Modern cars, especially new models, can be recalled for small adjustments and even safety checks. It is from these recalls that designers often develop improvements and apply them to new cars rolling off the production line. In the same way, although on a smaller scale, Product Designers make improvements to new designs by studying existing and old designs. A Product Review involves a designer or even a team of designers reviewing a product or model in minute detail. 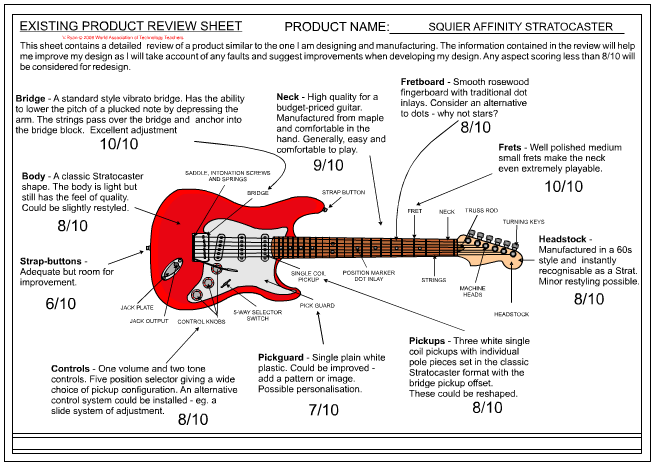 For instance, the guitar below is being reviewed by a specialist designer. He looks at every aspect of the design and every component and part considering how they can be developed so that the next design is even better. The guitar designer starts with a general look at the guitar he is reviewing. This is completed in minute detail and records are carefully recorded. The designer has found that the neck is high quality for a budget-priced guitar and manufactured from maple. It is comfortable in the hand and easy and to play. No improvement are considered for this aspect of the design. However, the pickguard is single plain white plastic. This could be improved by either using better quality material or by adding a pattern or image. The designers records this potential improvement. The designer gives each aspect of a the guitar a mark out of ten. Any aspect that scores less than eight is considered to be open to improvement. Aspects that require improvement are then rank in order of urgency with the lower scoring aspects usually being those that are improved first. (Not all designers use this system). 1. Choose an everyday object such as a mobile phone. Draw a picture of it or download an image. Glue it in the centre of a piece of paper and identify as many design aspects as possible. Then decide if each aspect can be improved further awarding a mark out of ten for each. 2. Choose another product, one that you think cannot be improved at all. Name the product and explain why you consider it impossible to improve.